Description: This autumn bonfire captures the faith-filled dimensions of the Halloween season with a mass (or prayer service), food (ideally potluck), and fellowship (with thought-provoking conversation). Prep Time: Depending on marketing and the extent of the program, the prep time for planning this event can be anywhere from one to three months before the scheduled event. On the day of the event, some prep time will be required in advance of the event. Ideal Time for this Event: This event is best held at night, after dark, and as close to Halloween as possible; most definitely, it should be done sometime in the month of October. The event can be done on the night of the holiday itself (and marketed as an “Alternative Halloween Experience” for young adults in the community), or during the weekend immediately preceding October 31. If it is held on Halloween night, consider having a Vigil Mass for All Saints Day as the prayer portion of the program. Who is this for? This event is appropriate for all young adults. Reserve the Space: The ideal setting would be a parish with a chapel or church that can be used for the prayer service, an area for the food to be served and/or eaten, and an outdoor area to be used for the bonfire. Variations on this could include hosting the prayer service outdoors or instead of a bonfire, use an indoor s’mores maker or fireplace. Traditional parish communications: bulletin, pulpit announcements, posters and flyers around the parish, handouts at the back of the church, etc. Digital marketing via Facebook, Twitter, and an event website (or more effectively, a Facebook event page). E-mail communication to young adults in the parish community, or who have come to previous activities; in addition to this, encourage “regulars” to bring along their friends, especially those detached from the practice of the faith. Put up flyers around the local community, in favorite coffee shops and stores. Put up flyers at and collaborate with area Halloween costume shops, Hallmark-type stores, local corn mazes and pumpkin farms, and other businesses that are popular in autumn and in advance of Halloween. 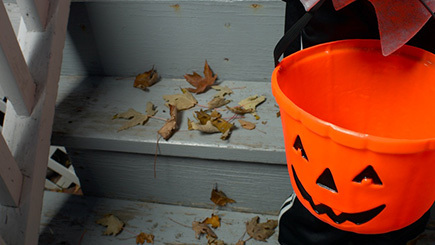 Send out a press release to the local newspapers, with a “pitch” that this is a Catholic perspective on Halloween; it might get picked up as a unique approach to the season, apart from the traditional Halloween news stories. Collaborate with other parish ministries such as Adult Faith Formation, Marriage and Baptism Prep Ministries, Welcome Ministries, RCIA, among other groups in the parish that intersect with young adults. Collaborate with other local parishes, the diocese, and other Christian churches who might welcome a creative idea at this time of year. Tip: Promotion for this event should begin in September, when people are thinking about Halloween, and get more intense in the weeks leading up to the holiday. Prayer for Program Planner: Almighty God, creator of the universe and lord of the harvest, be with us as we plan this special evening for young adults. Help us to grow closer to You through the saints and souls who have gone before us. Give us courage to face our fears and hope through the darkness. Strengthen us for the mission that You have called us to this night — to reach out to those in their 20s and 30s, sharing with them the Good News of Christ Jesus Your Son. In His name we pray. Amen.